Comment: Wanting to install 2 new bathroom exhaust fans that are larger than the existing fans. Comment: I'm looking to have an exhaust fan/light combo that I already purchased replace a ceiling light in my shower. The exhaust duct would need to go to a soffit vent, and the fan would be about 3 feet away from the soffit. Electric wiring is already in place for the ceiling light so I don't think new wiring would be required. Job location is Moore, OK. Comment: Ceiling fan won't work. Flip the on switch and nothing. Comment: Remove and install 2 new ceiling fans. Comment: Already have fan. Need labor only. 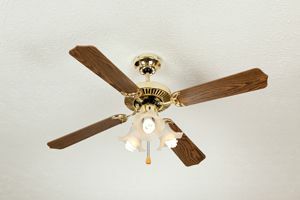 Comment: I want to install a ceiling fan that has no existing wiring. Oklahoma City Fan Services & Companies are rated 4.72 out of 5 based on 421 reviews of 8 pros. Not Looking for Fans Contractors in Oklahoma City, OK?